Claire on the left, Kristina on the right. Kristina organized the first Westbrook Weekly Wednesday Wramble of 2012 and the Hawkins were the ones who bit. Because we represented 80% of the riders, the ride started at our house. We cruised down the sculpture park and then let the wind carry us up Myrtle Edwards. In this photo, I've just been gapped and in the next, T is exhorting me to get the led out and chase the girls down. The only catch is that I'm the one hauling the family so acceleration is somewhat freight train-like. Speaking of freight trains, we made it down to the train bridge on the way to the locks but while waiting and trading stokers (A tried it out and demurred) none came. The locks turned out to be our turn around spot and we played a massive game of Duck Duck Goose and found flowers as big as our heads. Total mileage: 9 for the rec ride and 20 for the commute. Had a concert at Shoreline Community College today with Jensina Oliver and Robin Peery. This was something I have been practicing a lot for and it turned out great! 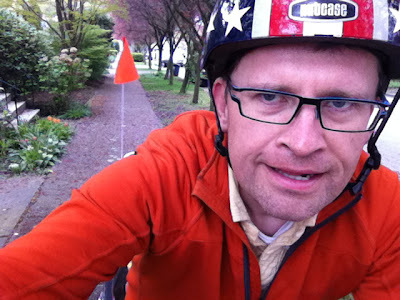 The weather was fantastic and I biked up some rather sketchy roads, specifically 3rd Ave NW north of Holman Road which inexplicably has sharrows on it but has tons of traffic trying to escape the lights on Greenwood. It also has no shoulder and the drivers really think that anyone in their way is trespassing. 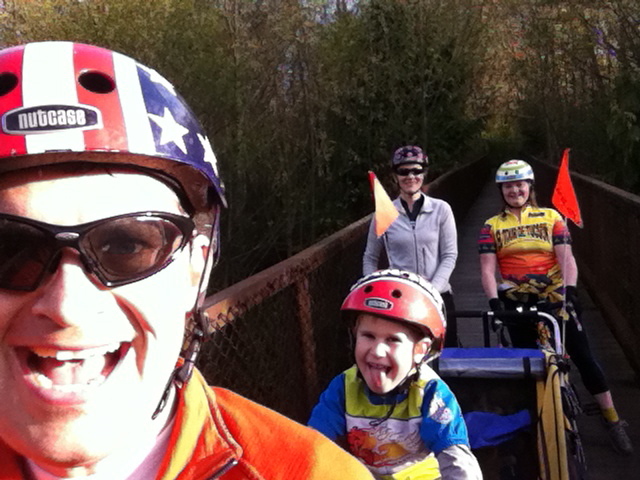 So I biked up into Magnolia for church and took the regular route up the Magnolia Bridge, then left early and had my mom take my place teaching the kiddies to sing. Then the ride up to Shoreline took about an hour. Played the concert, shook lots of hands, made some new friends, and helped people really appreciate Leonard Bernstein's later music. It was great. 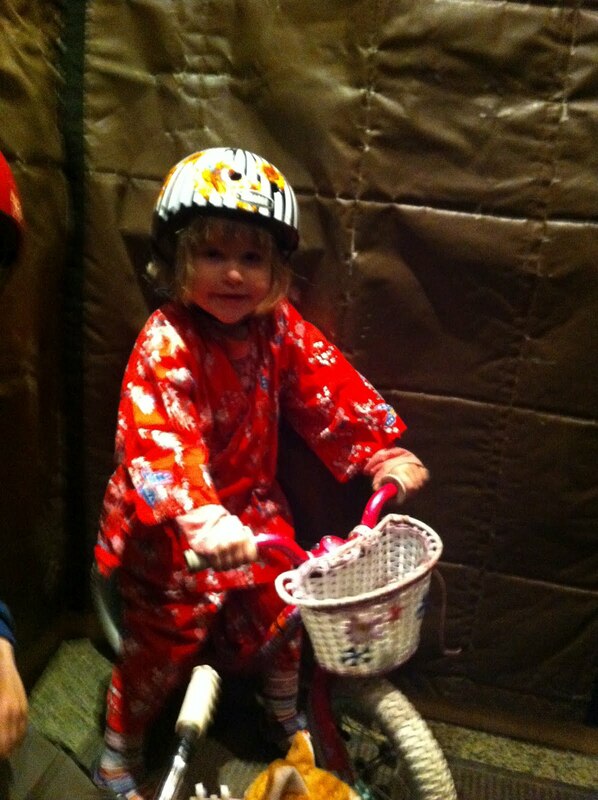 Rode home, T was ready to go ride, and away we went to Seattle Center to play with cars and ride B-bikes. While there, we saw a flag football scrimmage and saw a private birthday party at the Children's Museum. I was pretty spent and fell asleep before the kids did. They are up right now and it's 10:35. Claire let them nap. I think that I'll go back to bed and put the photos up tomorrow. Stay tuned. This is the shoe bank. It's where little 3 year old girls leave their shoes so that doting fathers and come up with a pretext to take another bike ride. This bank also doubles as the parking lot for the Washington Museum of History and Industry or MOHAI. We had come here for a 520 bridge meeting the day before but had left a shoe in the parking lot. People don't seem to steal kids shoes and when I went back the next morning, it was still happily there and waiting for me. 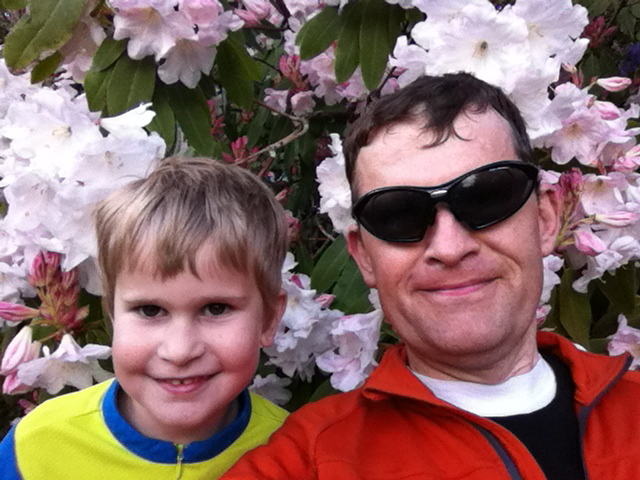 I rode down to MOHAI with Ansgar with whom we have had some nice bike tours. He takes the bus to the Soft, and I was trying to find a shoe and a pump bracket. 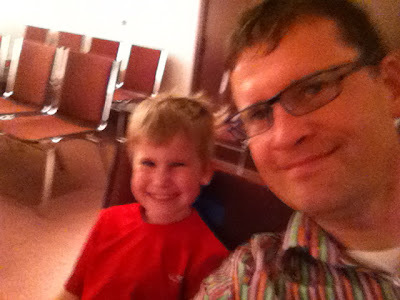 I went home and practiced my cello and then raced up to spend the afternoon with the family before T's piano recital. This is T at his piano recital. He played very well and I was proud of the little guy. The concert took place at Sherman Clay Pianos and Claire dropped us off after cancelling due to an inconsolable, shoe losing, toy dropping, face scratching 3 year old demanded her complete attention. We then bused home and got doughnuts, and then bused some more. Here is the best part. I had a concert down town and had arranged for child care so that Claire could come with. We biked down together through Mariners traffic and I played the show, which wasn't too great but will be better next week when we have our official CD release party. 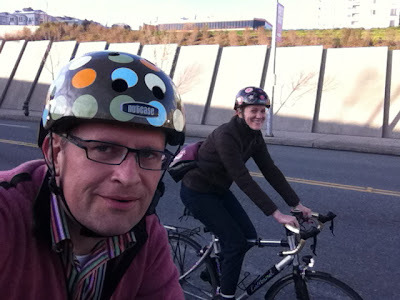 Riding together on a date reminds me of before we were married. In fact, Claire is still riding the same bike as in those salad days. Had the kids from dawn to dusk. They were marvelous. We made it to school on time even though they woke up about an hour later than usual, we had a great playdate during the crummiest part of the day and the wind was powerful and cold but the kids did their extra Easter Egg Hunt at Golden Gardens and there you go. But I didn't get to ride until late. Funny story though, while exiting Golden Gardens, Jan Heine pulls up to the stop sign. I yell that I'm giving him right of way and he turns around and races back up the hill. T recognized that we both have the same Seattle Randonneurs jersey and so we followed him up the hill at 12-20 mph on the switchbacks up from Golden Gardens. It was fun. I did my best Phil Liggett impersonation and yelled things like "he's opening up his suitcase of courage" and the similar, which I hope Jan appreciated. When we reached the top, I got all the kids to scream and yell and I honked the horn and cheered something about a polk dot jersey coming his way and he waved us on, smiling as we passed. At least, I hope that he's still smiling. I had a rehearsal in West Seattle later tonight and even though I was super late, I just needed to get on the bike. 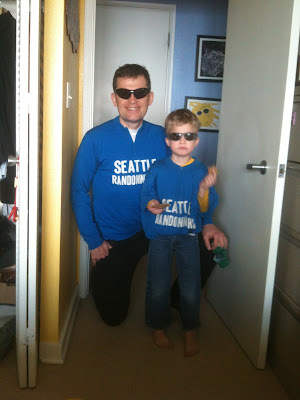 It was perfect; ran into Kole Kantner and we rode from Alaskan Way to Delridge, chatting and cheering each other on. Another great rider. Mileage must have been somewhere around 13 or so. I have no idea but while riding up in the afternoon to pick up the kids, I noticed that this duck was crossing the street, in front of a bunch of cars who dutifully stopped. And yes, the duck crossed in the crosswalk. You know how you can go hiking and then come across a game trail and follow it? Perhaps this duck sees all the people crossing there and sees it as some sort of "game" trail. Remember, they eat off of us. We humans provide. Now, I would like to draw some contrast to the day before. I was on the same road, riding southbound just north of this intersection and four kids between the ages of 6 and 11 were attempting to cross the road and had been on a long straight as long as I was on it. Numerous cars just drove past as the kids tried in vain to signal that that they were trying to cross. 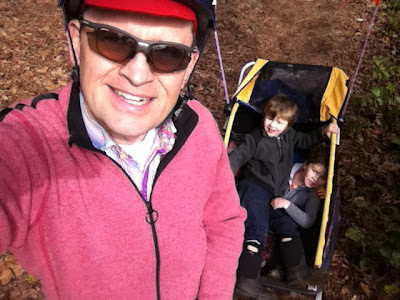 When I came up, I pulled out of the bike lane and stopped traffic, pointing to the kids. Oncoming traffic didn't stop. 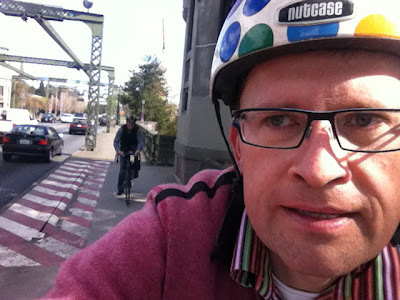 The SUV behind me got pissed and passed me in the bike lane just as the kids started to step into the lane. Needless to say, the driver kept on driving. Seattle is a place where drivers stop for ducks but don't stop for kids. Remember that. Now back to the day of riding. The kids chose the trailer and they were extremely prescient in that because it rained super hard on the way from SAGA to piano lessons. This was also a new route that includes the Aurora bridge which is much, much nicer than the Ballard bridge. It's wider, more protected and has a superior view. The only problem is figuring out what to do at the south end of the bridge on the west side. The sidewalk is ridiculous that leads to the 5 way intersection at 4th N.
The kids loved it, I had a great ride, and I discovered the joys of dropping the trailer at preschool and enjoying some seriously fast riding in the middle. It was a good biking day and I'm glad that at least the duck is safe. Really enjoyed going out and floating boats for the afternoon. The Center for Wooden Boats has toy sailboat sailing on the weekends. This boat above is from a prior CWB event where we made our own and the kids use them every time they get in the bath. A didn't fall in. Here, T is eating as much Easter candy as he can before lunch. He's developed the ability to ride on the side loader and stand on it and surf along with just one hand on the bars. Claire is virulently non-plussed. Biked over for a lesson and then up to Lakeside for teaching two more classes and then a rehearsal. Took the cello bike, which has a nice, clean chain. It was also the prettiest day of the year and I gave up doing the Fleche for a day of teaching kids how to play Brahms. I should look into my priorities a little. Had a long day teaching but didn't need to take a cello. Had to get the kids to school but didn't want to drive. Enter the family bike. It's been pretty cold so I haven't used it but took it out this morning and froze the kids. On the way there, we saw a construction site that was laying a concrete sidewalk. We stayed for a while and the workers liked it. Then we came upon Ravenna Blvd and discovered the wonders of the RX-700 Asphalt Scraper. That sucker is loud! Got the kids to school eventually. We were very late. Then rode to Lakeside where I gave notice for next year. I've really enjoyed the forced exercise that riding 20 miles each day to work and back puts into my body, but I'm looking for some other challenges, this time musical. Two Wheels Good, Three Wheels Bad. Got rid of this plastic wheeled monstrosity, did a couple of errands which I have not figured out how to do with a bicycle, namely move a daughter, an accordion, and an electric piano at the same time, but then got a good ride up to work and then had a startling and illuminating rehearsal with Jensina in preparation for the concert on the 15th. I need to get back to practicing. I'll perform the 3 Meditations for Cello and Piano at Shoreline Community College on the 15th. It's hard. Mileage for the day: 21 miles. The kids have been getting off easy this year because I've taken over the teaching position of a friend who is on maternity leave. Therefore, to save a little bit of time and help Claire get the work done that she needs, I've been driving the kids to and from preschool. I hitched up the tandem to the trailer and offered the second seat to T who politely relegated himself to the trailer with his dear sister. We pulled out and up the ramp and I remarked to myself on the amazing traction of dry concrete, even when riding an unloaded tandem on it. It's a late Burley tandem with OX platinum tubing and I'll be darned if it doesn't feel faster than my Surly single bikes. I rolled up to preschool and unloaded the kids. We had an extra breakfast and then I rode back home, but first picked up some goodies for the bikes, namely a cable set, some bar tape for the cello bike, and another pump bracket so that all my bikes will elegantly hold a pump. 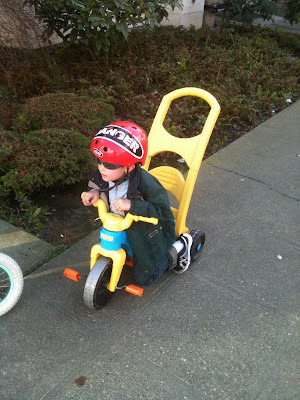 Did some cleaning, loaded four kids bikes into the van, then drove it up to preschool where I picked up mine plus one more for a playdate. Then to Claire's and then they dropped me off to pick up my bike and cello for work. 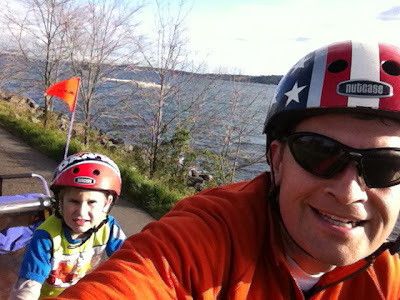 Rode up to Lakeside, taught some kids to play the cello, rode to my offsite lesson, then home again by 7:30, all in time to figure out my business profit/loss for 2011. I waited perhaps a little to long to do my taxes. But the end is in sight. Total mileage 32 miles (12 round trip to preschool, 20 round trip to Lakeside). My body feels much better. Three community centers in one day. No pictures and only biked to one of them, strangely, the hardest one to get to. I signed up T and A into some community center classes. In the morning, we biked over on the tandem with the trailer to the Magnolia community center for basketball/soccer camp for little kids. Then we drove over to Queen Anne cc for a first swimming lesson. We took the van because we had to pick up Claire from work and the timing was tight. Then I was late and didn't feel very good anyway so I drove up to work for the first time in a month. After teaching, I drove to the Bryant community center to hear Sally Bagshaw give a great demonstration on the new Neighborhood Greenways plan, a horribly flawed plan that I hope works great and better than I fear.